By now you probably know that native advertising, the relatively new kid on the marketing block, is here to stay. You’ve heard about how advertorials, editorial sponsorship, branded content and custom content can associate your brand with compelling and informative stories that your potential customers want to read. But if you are confused about what exactly native advertising is—and the different types of native opportunities—you’re not alone. That’s why C&EN BrandLab created this handy cheat sheet that defines the different forms a native advertising campaign can take, explains why you’d use one tactic over the other, and provides helpful links to examples. Before we get to the differences, it’s worth noting what all native ads have in common: They are clearly labeled as advertising. No one is looking to pull one over on the reader by disguising the fact that native content is from, or associated with, a brand or organization (which is good because readers don’t tend to like that). Now let’s dive in and clear up any confusion. With a content sponsorship, the advertiser pays to be listed as a sponsor of content created by the publisher. The editorial could be a one-off article or a series of articles, with a single sponsor or multiple sponsors. The topic might be related to your business, but it won’t actively promote your company. The publisher is in control of the content, meaning you won’t have a say in what gets written. Often the publisher, like our own C&EN BrandLab, uses writers or reporters who don’t produce regular editorial for the publication to maintain a full “church and state” division between advertising and editorial. But, like standard editorial, the goal is to create high-quality content that engages the reader. This is not the B team. You sign on as a sponsor to a general theme or topic, and your work is done. The publisher knows its readers and has more flexibility to focus the story on trending or engaging sub-topics. While the publisher may involve your company in the story (maybe as a source, depending on how the story develops), you don’t have control of the copy. You want the copy to be overtly promotional. This piece on the rising demand for cannabis chemical analysis is sponsored by three companies, listed at the end. Representatives from two of the sponsoring companies also served as sources for the piece. This article on tools, tips and techniques to make lab work easier is sponsored by a single company, which is listed at the end of the article. This article, sponsored by a cancer center listed at top, discusses the link between obesity and cancer. This slideshow of compelling photographs from USA Today over the past year includes explanatory audio from the photojournalists who took the shots. Ads from the sponsors are interspersed in the slideshow, and their logos appear at the top of each slide. Advertorials are advertiser-created content that runs within or adjacent to regular editorial. Advertorials often aim to tell a story that corresponds in some way with the editorial in which it’s placed. They can also be distributed by the publisher as supplemental, standalone publications with one or multiple advertisers providing the copy. The key here: The publisher is not involved in creating advertorial content, except to publish and distribute it. You have full control of the content. You guarantee placement in an issue or around a theme in which your advertorial best fits. You can still leverage storytelling tactics. You don’t have the time or resources to create compelling content. You want to be an exclusive partner but don’t have the budget. This advertorial, which ran in a C&EN issue covering drug ingredient analysis, provides detailed information on an upcoming conference. This supplement to C&EN was polybagged with the print issue, lives online and includes 19 application notes contributed by 10 instrumentation companies. While this link takes you to the article itself, this advertiser-produced article and video are linked from the Motor Trend homepage. Similar to an advertorial, the advertiser creates branded content and it runs adjacent to regular editorial. However, branded content is reviewed by the publisher to ensure that it adheres to the editorial style and standards of the publication. This is a great opportunity to tell your brand story. You have a lot of control over the content (though the publisher will review it). You don’t have the time or resources to create or collaborate on compelling content. You don’t want any publisher input on the writing or design. This C&EN Media Group whitepaper was written by an advertiser. C&EN Media Group then reviewed the paper for scientific accuracy, designed a cover page and promoted the paper through its media channels. Like a content sponsorship, the publisher creates the content. But with custom content, the advertiser is more involved, often providing sources and input along the way. These types of native ads tend to be part of larger campaigns in which the publisher is in charge of not only the writing and design, but also the media plan. It’s a one-stop-shop approach to content marketing. As with content sponsorships, the publisher will use professional (staff or freelance) writers to create engaging content, while still maintaining the “church and state” division between advertising and editorial. The content will be professionally written according to the publication’s standards. You have more control over the final product than with a content sponsorship. You want a one-stop shop for your content marketing campaign. You don’t have full control over the content. You want the copy to be overtly promotional. Your campaign needs to go out the door… tomorrow. This sponsored article was written by a professional writer hired by C&EN BrandLab, but includes a Q&A with the sponsoring company’s CEO and the company reviewed the article before publication. The sources for this article were provided by the sponsor, which also reviewed it before publication. This interactive piece was created on behalf of OppenheimerFunds by the internal creative studio at the New York Times, TBrand Studios. 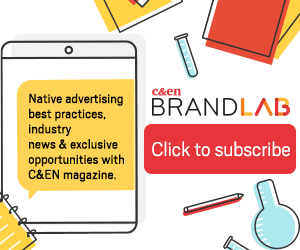 The four defined terms above are the most common ways to describe the native advertising options that C&EN offers, but following are some other terms you might hear when entering the native advertising world. Sponsored Content: As mentioned above, this term is often used for labeling purposes. C&EN uses this term to identify advertiser content for its readers. Content Marketing: This term often relates to blogs, infographics and other content that a company publishes itself. Native advertising can be a part of a company’s content marketing strategy. For instance, a publisher can create a scientifically accurate infographic to be distributed in its publication and also via your own email marketing programs, blog content, and more. Brand Journalism: Often used as a synonym for content marketing, this term refers to the use of journalism tactics—research, reporting, storytelling—in the service of promoting a brand. Often this is an internal strategy. Read more about GE, IBM, and Verizon’s strategies here. Through the power of storytelling, native advertising can help your company build brand awareness, establish thought leadership and demonstrate the value of your products. Whether you choose to create the content yourself, collaborate with the publisher or simply sign on to publisher-created content, native advertising offers your brand an exciting new way to engage its audience.